So, here we are: we have just completed our third Google Summer of Code™. Despite the nostalgia that has settled in after the end of the summer, we are all feeling very, very happy about how things went this year. While observing my fellow mentors, who are busy integrating our students' contributions into our code base, I am tempted to reminisce about our three year history with the program and the lessons we've learned. First of all however, a quick history of our participation: Our adventures started in 2007 when we were accepted into the program for the first time. I can still remember jumping all around the room when I saw SIP Communicator's name in the list of accepted organizations. Back then we were a brand new project and this acceptance was a tremendous recognition. As it turned out later, it made a great difference in terms of popularity, credibility, and bringing new contributors both directly and, above all, indirectly. Our first summer went exceptionally well. First of all, we had a decent number of applications, 87 to be precise, and by decent I mean not too much for the available mentors to handle and yet enough for us to have a wide choice of candidates. We received funding for eight student projects, which, as it turned out later, was also just right. At the end of the summer we had 7 successful students. During the months following Google Summer of Code 2007, we integrated virtually all the work that came out of it. We also voted and accepted two of the students as permanent committers. Then came 2008. Once again we were all rejoicing in anticipation of a productive summer. This time we had 187 candidates and were received funding for 20 student projects. At that point, however, we started realizing how big a number 20 is and we got a bit scared. We were afraid that would be too many students for us to handle so we decided to only take 15 and let other projects mentor the additional five. It turned out later that 15 was still a bit too many - more on that later. The summer went pretty well and a lot of work got done. Once again we voted and accepted two of the students as permanent contributors and only had a single failing student at the end of the season. This leads us to 2009, and boy was this year a good year! I can now safely say that this has probably been our best participation so far. We received a staggering number of applications: 203 to be precise. We only had around 15 mentors so it took us quite some time to go through all of them. Once we were done with the evaluations we requested 12 student projects but played it safe and decided to go with only ten, leaving the rest of the funding for other student projects. Once again, it was a really great summer. We are still in the process of integrating all the contributions and it will probably take us a few months before we are done. Even at this point, with about 30% of the work in our repository, we have already voted and accepted 2 of the students as permanent committers with probably two or three more to come in the the following months. Hip Hip ... Hoorray!!! 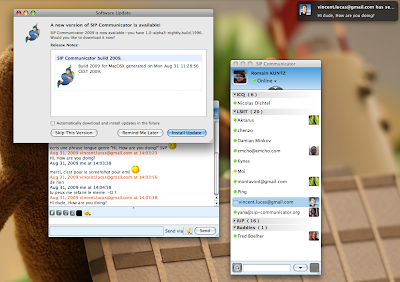 Egidijus Jankauska from the United Kingdom has implemented a native popup notification for the MacOS X version of SIP Communicator. It makes use of the Growl notification daemon through a new implementation of the Java bindings of the Growl API. For that purpose, Egidijus has implemented a dynamic library using Java Native Interfaces, a set of Java interfaces, and the corresponding implementations for SIP Communicator. The new born library can of course be used in other projects and this implementation has already been integrated in our source trunk. Egidijus has also updated our package update system on MacOS X. It was based on Sparkle 1.1, and Egidijus has provided the necessary patches and documentation to switch to Sparkle 1.5b6. This work has also been integrated in our source trunk. Egidijus has since been voted as a committer and is now part of our developer team! George Politis from Greece worked on extending SIP Communicator with Off The Record (OTR) message encryption. OTR provides encryption, authentication, deniability, and strong forward secrecy. 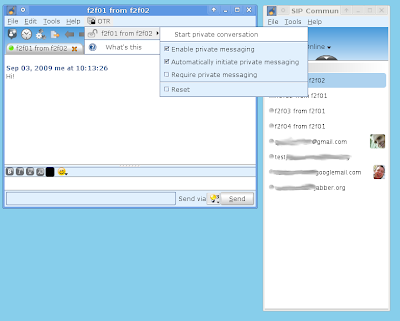 Until now SIP Communicator did not have any text message encryption and our chats were often unprotected. George started with the implementation of our own Open Source native java OTR library, which can also be used in other projects. George also implemented all the message transformation functionalities and the GUI necessary for us to integrate OTR support in SIP Communicator. It is already implemented in many of the other popular instant messengers such as Kopete, Pidgin, Adium, mICQ, Miranda, and Trillian. SIP Communicator is now able to carry out encrypted communications with other SIP Communicator clients and the aforementioned messengers. George's implementation has already been integrated in our source trunk and George has achieved committer status for SIP Communicator with a strong approval of our community. Ajay Chhatwal from India was in charge of implementing a Database system to allow us to store all chats in a database instead of XML files. Ajay has studied many database systems, produced a comprehensive comparative evaluation on them and suggested a winner that would best suit our use case. He has then implemented a database service and a backend to provide a working database service to all the components of SIP Communicator, after which he worked on a transition mechanism that would allow transferring XML files from the old implementation into the new database system. Once he completed his work on the history modules - yes, he still had time to hack before the end of the summer - Ajay has also coded a new version of the contact list service which now also uses the database service. We're hoping to vote Ajay in as a committer soon. This one was worked on by Brett Geren from the United States. The project consisted of retrieving the names of the applications that our buddies are using when chatting with us, and showing the application icons to the user. In order to accomplish this task, Brett first completed extensive research determining which of the protocols we support in SIP Communicator actually deliver such information and how they transport it. He then defined the interfaces necessary for a new user agent module and implemented the feature for MSN, IRC and XMPP. During the second half of the program, he worked on the user interface that actually displays the remote client icon and allows users to configure the behaviour of the user-agent plugin. He also completed tests with a long list of known clients in order to confirm the way they are publishing their client name and to make sure that SIP Communicator was working with them as expected. Ed. Note: This post is the first installment from the SIP Communicator project on their participation in the Google Summer of Code program. Look forward to even more information on their 2009 student projects and some in-depth details on lessons learned on this blog next week. Stay tuned!